You might have heard this one before – “I also used to be an atheist, but after doing the research and and looking at the evidence, I have discovered the deeper truths of life and have happily embraced Jesus Christ as my lord and savior” (or something to that effect). 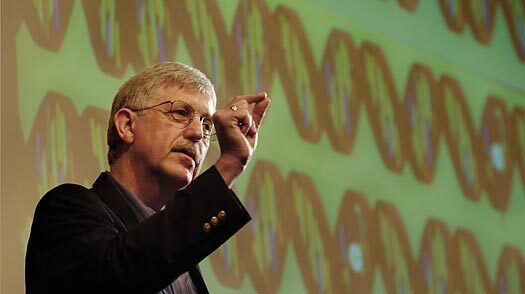 Francis Collins, fairly well known for heading the human genome project, started out as a chemist before becoming a medical doctor, and eventually finding his way to the very pinnacle of the field of genetics. And yet, during all of this he also became an evangelical Christian. At this point, one might ask why in the world I would lump together both the thoughtful and learned doctor Francis Collins and the credulous and uneducated Kirk Cameron? The answer is quite simple – they both commit the same fallacy. Each of these two men has reached a point in their lives where they stood at the edge of what they considered to be the known universe, peered at the unknown, and after a period of contemplation, decided to fall to their knees and accept a specific version of a specific Iron Aged tribal middle eastern deity as the thing that must fill this terrifyingly confusing abyss. The only difference between the two men is that Collins’ point of departure was quite a bit higher than Cameron’s. But despite the various differences between the two men’s theological views about the deity in question, both at a certain point decided to depart from the hardships of dealing with unanswerable questions, and take a leap that was not so much of faith but to faith; leaving behind not only their confusions and frustrations but also their reason and skepticism. Who am I to question such a prominent and accomplished scientific leader like Francis Collins, you might ask? But it is not I who has artificially elevated myself to the level of a prominent scientist, it is Collins who has dropped down, and committed a simple minded Non Sequitur. Collins himself admits that he had reached the limit of where his scientific research could take him. It was Collins himself who admitted ignorance (a perfectly respectable and honest thing to do, by the way), and then, admittedly outside the scope of science, bridged an honest ignorance to a subjective interpretation of an Iron Aged tribal middle eastern creation myth. Collins openly admits that this was his own personal spiritual leap of faith, but he somehow fails to realize that the subjective nature of this leap rather dismisses any empirical truth value it might contain. The act of leaping itself is a profoundly unscientific thing to do, and is an action that requires faith – a personal belief based on insufficient evidence. Moreover, the subjective nature of this leap makes Collins’ reaching evangelical Christianity logically indistinguishable from potentially reaching Catholicism or Islam or Judaism or Mormonism or Scientology. Therefore, if the good doctor makes such a blunt departure from his field of expertise, and commits such a classic logical mistake, there is no stretch in me (or any other non geneticist out there) calling him out on it. You can polish an ancient tribal superstition as much as you want, and Collins is quite good at it, but this will still not solve the logical problems it contains at its core. One cannot take a lack of knowledge from one field and use it to fuel a knowledge claim in another. By all means admit that you do not know what caused the big bang, or why the physical constants seem to be just right for the emergence of life, but how in the world can this lack of knowledge be used as the building blocks for the extraordinary claim that this was all caused by a specific deity called Yahweh? This is actually worse than a conventional Non Sequitur, where a conclusion does not follow a premise, or one claim does not lead to another, the two actually fly in opposite directions here. This is like saying that because I do NOT know what exactly causes gravitational pull, I DO now know how life first emerged; because I do NOT understand what brought about the physical constants of the universe, I DO know that there is a creator deity, and that his name is Yahweh. Next Post Which way to heaven?